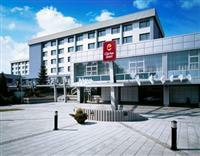 Clarion Congress Hotel is situated in the city of Ostrava at Zkracena 2703 and is within 5 kilometres from CEZ Arena and Avion Shopping Park. Other local attractions of Ostrava include, Chamber Theatre Arena, Fairytale Ghost Cellar, Ostrava Museum, Brewery Museum and Puppet Theatre. All 169 well appointed guest rooms at this property are air conditioned and furnished with manities such as spacious work desks, hairdryers, high-speed internet access, safes and cable television. After a busy day of sightseeing or long day of business meetings, the hotel's restaurant and cocktail lounge, the Atrium Piazza D'Oro, is the right place to relax with a delicious meal and fine drinks.